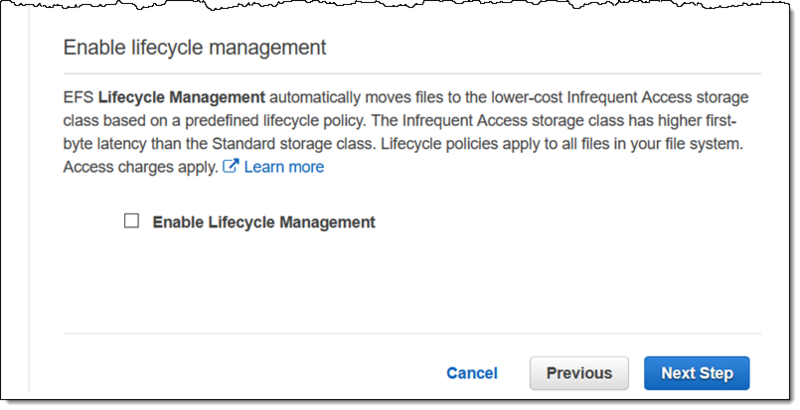 EFS IA reduces storage costs for files not accessed every day, with savings up to 85% compared to the EFS Standard storage class. This entry was posted in AWS, Cloud, Computer, Murmuring, Network, Service and tagged access, amazon, aws, class, cloud, cost, efs, ia, infrequent, log, nfs, pricing, saving, service, storage on November 27, 2018 by Gea-Suan Lin. This entry was posted in AWS, Cloud, Computer, Murmuring, Network, Service and tagged amazon, aws, cifs, cloud, efs, elastic, filesystem, fs, network, nfs, service on July 13, 2018 by Gea-Suan Lin. 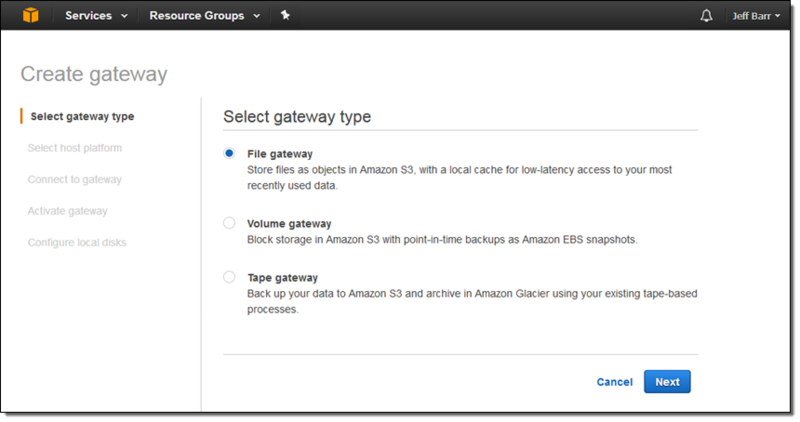 Amazon EFS is also available in US East (N. Virginia), US East (Ohio), US West (Oregon), EU (Ireland), and Asia Pacific (Sydney). This entry was posted in AWS, Cloud, Computer, Murmuring, Network, Service and tagged amazon, aws, cloud, efs, elastic, file, filesystem, frankfurt, germany, nfs, saas, system on August 2, 2017 by Gea-Suan Lin. After you set it up in your data center or in the cloud, your configured buckets will be available as NFS mount points. Your application simply reads and writes files and directories over NFS; behind the scenes, the gateway turns these operations into object-level requests on your S3 buckets, where they are accessible natively (one S3 object per file). This entry was posted in AWS, Cloud, Computer, Murmuring, Network, Software and tagged amazon, aws, bucket, cloud, file, fuse, gateway, interface, nfs, object, s3, storage on May 1, 2017 by Gea-Suan Lin. This entry was posted in AWS, Cloud, Computer, Murmuring, Network and tagged amazon, aws, cloud, efs, filesystem, fs, nfs, sydney on March 26, 2017 by Gea-Suan Lin. This entry was posted in AWS, Cloud, Computer, Murmuring, Network and tagged amazon, aws, cifs, cloud, efs, elastic, file, nfs, system on June 29, 2016 by Gea-Suan Lin. The difficulty of integer factorization is fundamental to modern cryptographic security using RSA encryption and signatures. Although a 512-bit RSA modulus was first factored in 1999, 512-bit RSA remains surprisingly common in practice across many cryptographic protocols. Popular understanding of the difficulty of 512-bit factorization does not seem to have kept pace with developments in computing power. In this paper, we optimize the CADO-NFS and Msieve implementations of the number field sieve for use on the Amazon Elastic Compute Cloud platform, allowing a non-expert to factor 512-bit RSA public keys in under four hours for $75. We go on to survey the RSA key sizes used in popular protocols, finding hundreds or thousands of deployed 512-bit RSA keys in DNSSEC, HTTPS, IMAP, POP3, SMTP, DKIM, SSH, and PGP. This entry was posted in AWS, Cloud, Computer, DNS, Murmuring, Network, Security and tagged amazon, aws, cado, cloud, ec2, eprint, factoring, nfs, rsa, service on October 17, 2015 by Gea-Suan Lin.